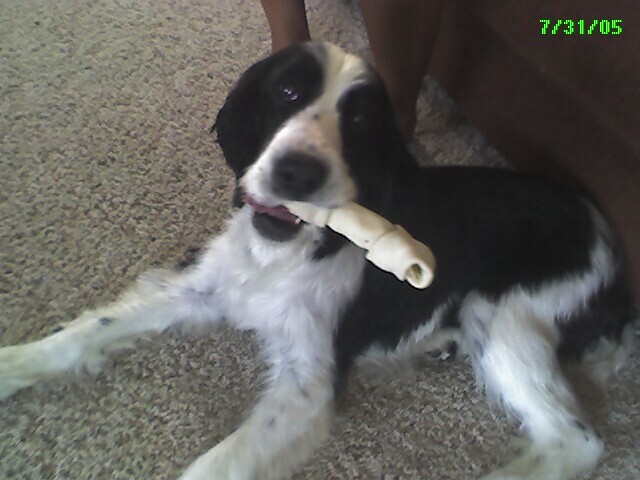 Back in early 2003 I started my search for another Springer Spaniel to add to our family. I grew up with the Springer breed and had a true affinity for their sporting abilities and family friendly nature. I came across a website link called English Springer Rescue America. (www.springerrescue.org) where I saw so many beautiful purebred English Springer Spaniels pulled from pounds all across the United States. I knew what I wanted….a liver and white male field bred dog with a docked tail. When looking for a match, I was shocked that a breed that I had so much affection for could have so many dogs abandoned, unwanted and neglected. That is when I came across this skinny little guy named Cooper. He was a male, but not much of a match for what I had in mind. He was black & white, a show bred dog with a long, feathery tail. But that face, it just got me! So I applied for Cooper and a few weeks later we went to meet this guy out in Warren at his foster home. He came home with us that day and has been ruling our lives ever since. The photo shows one of his favorite spots perched at the kitchen table! I should be proud, right???? 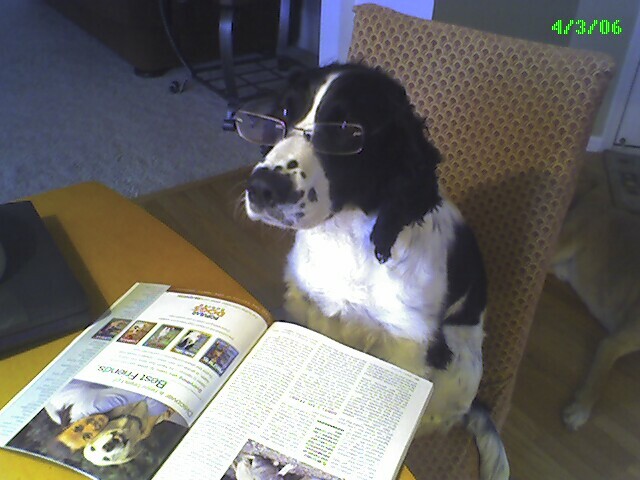 He can read! Eventually it became clear that I could not get these rescue dogs out of my head. So I decided to volunteer for ESRA. I started doing transports and that is where I met my first foster dog, Brittany on her way into Ohio from a Michigan Kill Pound. She was a senior….so quiet and sweet, but her health was terrible. She had cancerous tumors removed, she had badly infected teeth extracted, she had terrible skin allergies treated, she had seizures controlled by meds, but she still had more life to live. She was with us for 21 months before she passed on and was the best thing that I could have ever asked for as far as a dog goes. She loved her new life that we had given her and made sure we knew it every day when she pranced around proudly with a bone or jumped up on the couch to curl up right next to you for some lovin’. But rescuing my own Springer, transporting and fostering Springers just did not seem to be enough especially with all the mixed breed dogs in high kill pounds that purebred rescues can’t take in. 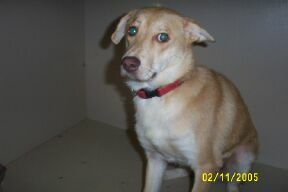 I had a pound right in my backyard in Lorain County that still uses the gas chamber for goodness sake. Their faces in those cages haunted me too, so I needed to do more….it was just that simple for me. So in February of 2005 I rescued my first terrier mix that I named Gracie and so the love affair goes on and on. With each day and each dog, I have met so many good people who give selflessly to care for these animals. I have also been lucky enough to find volunteers to do the work with me. Rescue work is not a one person operation. It takes many dedicated hands to put the pieces together and to give each dog what they need to be rehabilitated and rehomed. I am thankful that I found this work….it is truly my life blood and a calling I cannot ignore. I only hope for each person reading this story, that you too find something to be passionate about and committed too. There is nothing like the rewards from giving especially when it is wet slobbery puppy breath kiss!